Season 6 of The Walking Dead came to a terrifying and frustrating conclusion when the finale failed to reveal which of the good guys got a face full of Lucille. Luckily, details are starting to emerge about Season 7 that are much more fun to ponder than who was killed by Negan and his baseball bat. It looks like the show will be casting a major character from Robert Kirkman’s Walking Dead comic series, and he’ll definitely shake things up. The latest character to make the jump from page to screen is likely Ezekiel. The Walking Dead is looking to cast an African-American actor in his 40s for this new role. The character’s name given for casting purposes is Augustus, but he has been described in terms that fit no comic character better than Ezekiel. According to TVLine, the new character is set to bring a combination of wisdom, oddity, and exuberance to the series. Negan was originally called “Rich” during the casting process, so there’s reason to believe The Walking Dead would show similar restraint in casting as major a role as Ezekiel. In the comics, Ezekiel is the leader of The Kingdom settlement. He has proclaimed himself as a post-apocalyptic king. Luckily for Rick and the other survivors, Ezekiel is nothing like Negan and his weapon wrapped in barbed wire. Instead, he has a pet tiger named Shiva that he’s kept with him since the fall of civilization. Considering that Robert Kirkman has shown enthusiasm for the possibility of a real live tiger and showrunner Scott Gimple tellingly refused to deny that there would be a tiger, we can guess that Ezekiel will make quite the entrance with Shiva by his side. The world of The Walking Dead has grown a great deal since Rick and Co. made the journey north from Georgia, and the Kingdom would be only the latest in the scattering of settlements in the Virginia area. The surprisingly kindly characters that showed up in the last two episodes of Season 6 are almost certainly citizens of the Kingdom, so we may discover that Hilltop is not the only potential trading post in the area. Helping Carol and Morgan at the very least means that they might make a better impression than Jesus did when he tried to rob Rick and Daryl. The news that The Walking Dead is casting “Augustus” comes on the heels of a spoiler spreading on social media that Ezekiel was definitely on the way for Season 7. The spoiler was later pulled by Robert Kirkman’s Skybound Entertainment. There’s no saying for sure whether those spoilers did indeed have a source somewhere that went undiscovered, but it looks like Ezekiel is indeed on the way. Unfortunately, it’ll still be a while before we get to see Augustus/Ezekiel in action. 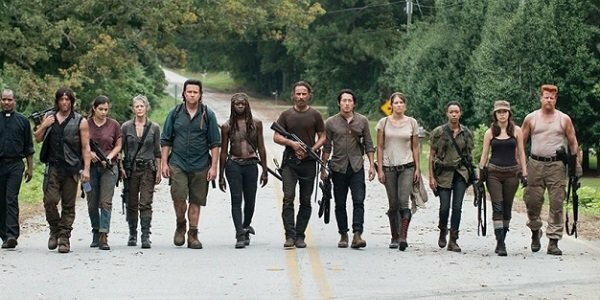 Stay tuned to CinemaBlend for Walking Dead news, and don’t forget to check out our summary of what we know so far about Season 7. For a look at what you can watch in the meantime, see our summer TV premiere schedule.